ArcGIS for Server makes available the enormous amount of information stored in the county’s data warehouse. Due to the enormous amount of information stored in the county’s data warehouse, which needs to be made available to those organizations doing local research, ArcGIS for Server has greatly benefited the county’s data portal project. 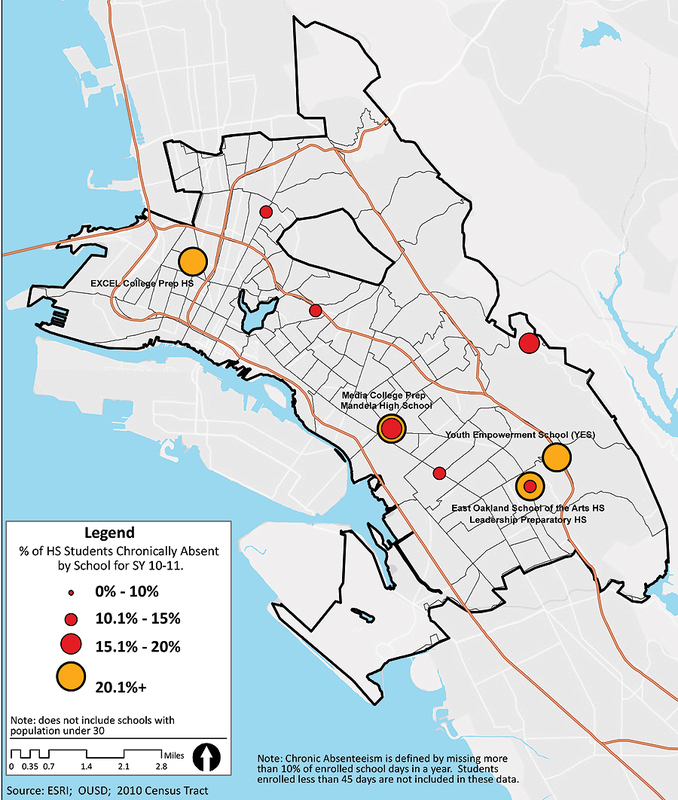 With ArcGIS for Server and REST APIs, the county can take very detailed Alameda County data about individuals that is collected through special nondisclosure agreements and aggregate it to a safe level for general use by local government agencies, such as OUSD, and the general public. 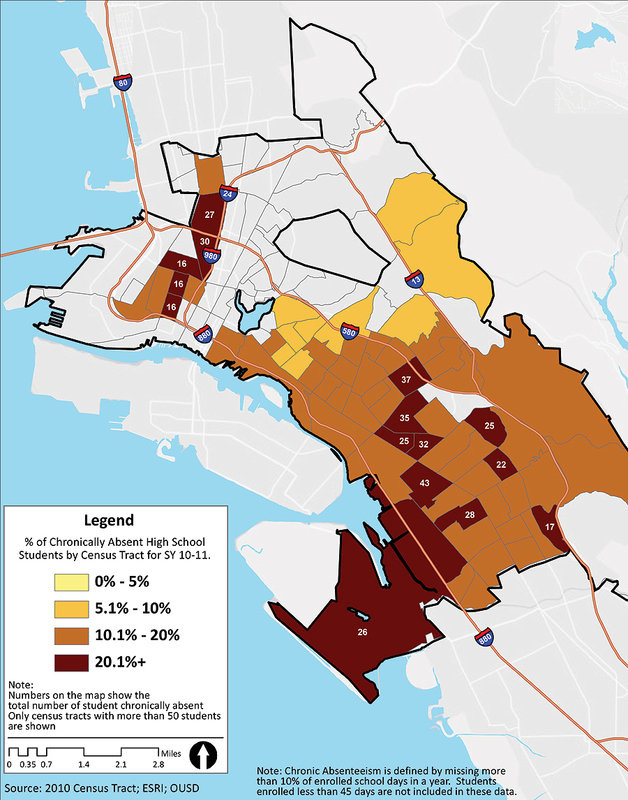 USC and OUSD are using ArcGIS to analyze the social and economic factors that dominate those areas with high rates of absenteeism to better determine why students aren’t attending school and what needs to be done to increase attendance. USC and OUSD have formed a partnership, which has increased the district’s use of USC’s geospatial datasets. 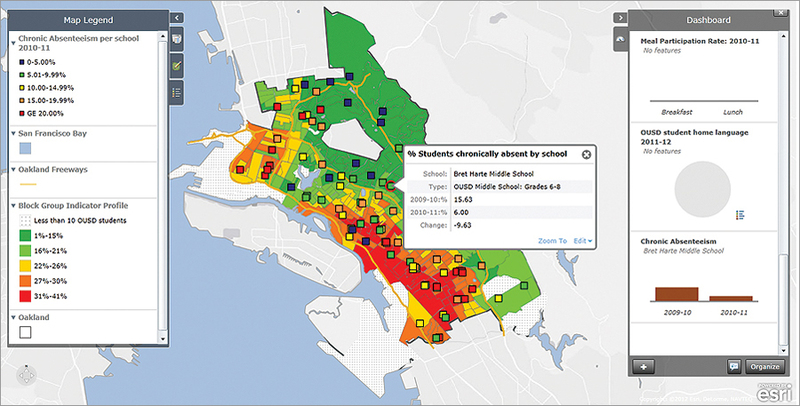 OUSD used ArcGIS for several years for administrative purposes, and its Research, Assessment and Data (RAD) department developed the Opportunity Mapping application to serve as a decision-support tool for district administrators and policy makers.